Easter is one of my favorite holidays, the Easter Bunny always surprises Daphnie with a basket full of goodies along with her very own Easter Egg hunt in our yard. This year is no different and I cannot wait for the day to get here, I am doing most of my shopping online as I am so busy this month with baby showers, cheer competitions and cheer try outs so time is not on my side. 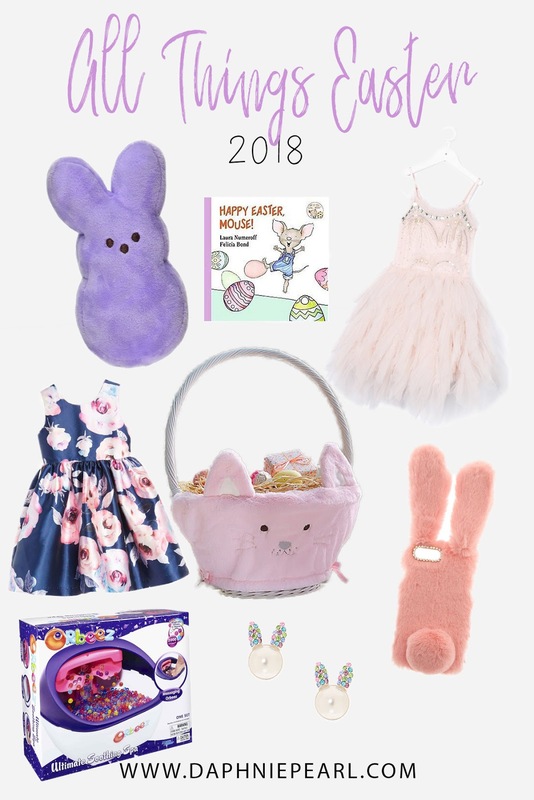 I thought I'd share with you a few of the things I'm looking at or have already bought for Daphnie this year! Picking out an Easter dress as a child was always so special. My dad and mom would take me every Easter to pick out a dress. I would ALWAYS pick the biggest floofiest dress out there! The bigger and floofier the better! The basket is the first thing she sees on Easter Morning, so I try to pick a super cute one that she'll just squeal over for days. Pottery Barn is having a sale right now, and free shipping site wide so I suggest checking them out for sure - link HERE, or through one of the images below. Below are all of Daphnie's favorite toys right now and would make perfect Easter gifts. I also try to always buy a book for Daphnie every holiday. I like to encourage her to read, plus it builds her library.